Last month I found myself hunting down family history about my great great grandfather, John Brewitt Milner (1830-1912), and learned a great deal about his life and especially his life changing decision to join the newly formed Mormon religion — the Church of Jesus Christ of Latter-Day Saints (though it wasn’t called that back then) — and come to America to be with other Mormons in Zion. Esther Elizabeth Yardley was born January 24, 1825 at Tanworth, Warwickshire County, England. Her parents were Thomas Yardley and Mary Rose of Tanworth. She was the oldest of 12 children. The youngest were twins. They lived and died the same day. Tanworth stands high midway between the two main roads which run to Birmingham from Strutfar on Avon on the east, and Alcester on the west. The church is a conspicuous landmark seen for many miles by the traveler on either of these routes. Tanworth was originally a clearing in the Forest of Arden. There is still to be seen an old oak at Beaumonts in the parish, said to be one of the old oaks of the Forest. The Yardley family is an old Tanworth family living there as far back as 1557 and many descendants are scattered all over the world. A number of the family of Yardley have become distinguished people, such as George Yardley, First Governor of Virginia in America. Elizabeth Yardley was born and educated in Tanworth and had much the same girlhood experiences as other girls at that time. Most everyone in the community belonged to the same church. When a young woman she went to take charge of her bachelor uncle’s household and servants in Birmingham England. She became acquainted with and married Thomas Edward Thurman in 1848. Esther’s husband, Thomas E. Thurman, was born December 21, 1821 and baptized in the church in May, 1849 by Elder Godsal. He had a confectionary store, and also worked as a sadler. Three years after their marriage he was stricken with smallpox. When he knew he couldn’t get better he called her to him and his dying request was to take their son, Thomas Edward Thurman and go to Zion. She was pregnant at the time of his death and a child named Victoria was born soon after. She prepared for her journey to America. Her oldest uncle was sympathetic with her and assisted her in getting ready for the trip. She sold all her household articles and only took what necessities she had to have. This was a great trial for these noble pioneers to leave their families and friends and embark for a strange new country. She secured passage on one of the sailboats of that day. They sailed from Liverpool April 19, 1853. they were seven weeks on the water and while out to sea the baby, Victoria, died and was buried at sea. Esther is my third great grandmother on my mother’s mother’s side. She was born in Tanworth-in-Arden, Warwick, England. She was the oldest of thirteen children born to Thomas and Mary Rose Yardley and learned early on how to help her mother with the duties of raising a large family, becoming a good cook and pitching in with the housekeeping. While still a teenager, Esther moved to Birmingham to run her uncle’s household. In Birmingham, she met Thomas Edward Thurman. The young couple married on 6 Nov 1848. The two had heard of the Mormons through visiting missionaries and agreed to attend their services. Legend has it that when Esther heard the hymn “O My Father”, she immediately formed a testimony for the truthfulness of the Mormon church. Esther and Thomas were both baptized on 7 Mar 1849. The couple had two children, a boy and a girl, but their daughter died just a few weeks after she was born. Shortly after, Thomas himself died of tuberculosis. Esther, forced to make her own way, opened a pastry shop and ran a boarding house. 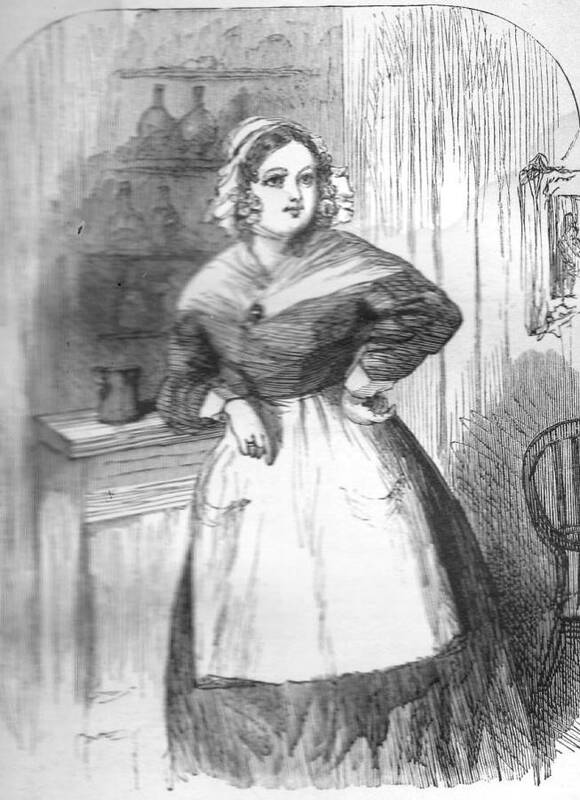 One of her customers was Charles Dickens, who was said to have later portrayed her as a pleasant and plump matron of an inn in one of his novels. A few years later, on 5 Feb 1853, Esther and her son left England aboard The Jersey and, six weeks later, they arrived in New Orleans, before making their way north to Keokuk, Iowa, a staging ground for immigrant Mormon pioneers. Here, Esther outfitted herself with a riding horse and a cow for milking. It is said she walked the whole way across the plains so her son and others could ride the horse. While on the journey toward the Utah Valley, she met John Brewitt Milner. The couple married the following spring and settled in Provo, Utah. They had seven children, including one daughter who died in infancy. Their fourth daughter, Sarah Ann Milner, my second great grandmother, was born on 29 May 1862 in Provo, Utah. I couldn’t find much anything about Esther Elizabeth’s later life. Many years ago my dad went to John Brewitt’s gravesite and was shocked to discover her grave was not beside our grandfathers, instead, it was explained by a cousin, “oh no she divorced John Brewitt Milner and is buried some other place”. The story about why they divorced was at least partially about her feelings on polygamy and not being too happy about/with the other wives. I’ve always enjoyed stories from Charles Dickens, and of all the many memories versions of “A Christmas Carol, I prefer the 1970 Version Scrooge the Musical, only the British could have caught and preserved a certain spirit in that wonderful production. I hesitate to share this next story because it is deeply personal but I think it’s time others know a family history story. The woman in this picture is Esther Elizabeth Yardley Milner, my second Great Grandmother. Esther had been married previously to a man other than my grandfather but, coincidentally I happen to have received his name, he was Thomas Edward Thurman and her first son was appropriately named after the first husband Thomas E. Thurman, upon the death of Thomas E. Thurman Sr, Esther married John Brewitt Milner and many years later I was named Thomas Edward Milner. Esther Yardley Milner has a unique history, when her husband died, she moved to London and opened a Sweet shop close to the London residence or at least working area of Mr. Charles Dickens. But it was clear that he had a friendship but not at all in a romantic way she was simply his friend. Grandmother spoke of these things and the stories were passed in our family, about forty years ago one of my cousins was in London doing family history research and located the deed with Esther’s name on it and even as she had stated it was near to Mr Dickens. The entire world knows that Charles Dickens portrayed his friends and associates in his novels, and Esther was portrayed in the novel Martin Chuzzlewit, she never bragged but simply said in reference to the novel that he treated her well. She is portrayed as the character Mrs Lupin, but what is really funny is the description of Mrs Lupin presented by Mr Dickens as follows.. Grandfather Milner had been an attorney and became a judge, he was counsel to George Albert Smith and accompanied him to Washington DC when we’re trying to establish statehood. So, people had become acquainted with Esther’s history as the character Mrs Lupin and these dignitaries would stay at the inn when visiting Utah. With the knowledge that Grandmother had the little sweet shop and Mr Dickens did in fact frequent it, there is a statement Charles Dickens made when the Latter-day saint groups were leaving England and Grandmother did in fact leave with those groups. I cannot be certain of this but I think he was making a pun which would have been well understood by those whom knew and we’re well aware of his daily visits to the sweetie shop where his treats were most likely cream based for the greater part. And now you know, but read the description of Mrs Lupin and look at Grandmother’s face! BTW this picture was taken approximately 50 years later so her hair followed accordingly.